Want The Stories Behind The Worldwide Plastic Bag Ban Movement? Factory Direct Promos (FDP) recently launched an interactive map https://www.factorydirectpromos.com/plastic-bag-bans that lets you track the movement to ban disposable plastic bags all over the world. This in-depth map features color-coded pins that indicate whether a location has a ban on the books, where a ban failed to pass or if an area has a law mandating a fee be levied on bags at the checkout. Our interactive and shareable map is a great resource because it gives the stories behind the events that led to the ban or fee and each location. The map also features a link back to a website that gives more info, so you can learn more about the location and their story if you want to. All of this information is pulled together in one location for you to read, learn and become inspired by and can be easily shared on personal or company websites and blogs. Oftentimes the solution that works in one area may not work in another, or the steps that lead to a solution may be drastically different, and this map illustrates this point beautifully. The scope of the plastic bag problem is different across the world. For instance, in California the main reason many people get behind plastic bag bans is due to the negative impact single use bags have on the environment and marine life. You can read about their massive campaigns that Californians have undertaken for months or even years in the effort to ban disposable bags. On the complete opposite side of the spectrum, in India numerous plastic bag bans have been put into place because the resulting litter clogged drainage systems which caused severe flooding. You can read more on the map about the intense floods that have sadly caused fatalities. There are many critics of plastic bag bans, but when you look at the situation in India and realize human lives were lost in floods caused by bag litter, it is hard to argue against a ban. Bans in India are also passed very quickly. Once the decision is made to implement a ban there may only be weeks or months before plastic bags are out. 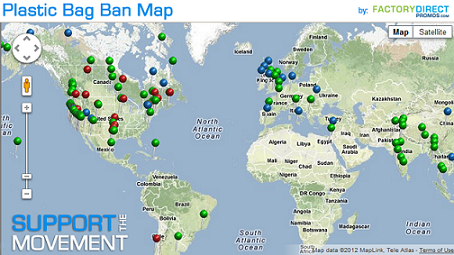 This map pulls these issues into focus and makes it easy to learn why and how plastic bag bans come about. Analyzing the map also shows how the movement spreads. All too often one city will pass a bag ban and this will inspire neighboring cities to do the same, and so on and so on. Before you know it huge sections of the map are blanketed in bans. There are also many instances in which several towns in a single county have their own unique bans and the county government will follow up with their own bag ban either to cover areas not impacted by other bans, or to create one law that overrides the other bans to eliminate any confusion or hassle for shoppers. The FDP interactive bag ban map also tells the story of a completely unique set of circumstances in towns throughout the United Kingdom where retailers have banded together and agreed to no longer give out plastic shopping bags. Participating stores will sell, or in some instances give away, reusable shopping bags in an effort to make their towns free from plastic bags. In these instances there is no law, these efforts are completely voluntary. It is so inspiring to see people band together and do the right thing just because it is the right thing – not because there was a law forcing them to do so. This map is exciting because as new laws are created and the landscape of the movement changes, the map will be updated to reflect this. Locations will constantly be added and as laws change for locations already on the map, these adjustments will be reflected too. Check it out, share it on your blog or website https://www.factorydirectpromos.com/plastic-bag-bans. Take some time to go through the map and read about how people all over the world have tried to address the plastic bag problem. Get inspired and see if you can start a movement and get your home on the map. Next Next post: How Does Delhi Plan to Make Failed 2009 Bag Ban Law a Success? Plastic bags are useful. Thr problem is their lack of reuse and disposal. Why not a “bag deposit” say 5 cents. What person in financial difficulty couldn’t find 10 bags to return for $1. Actually a very interesting idea Charlie. Unfortunately plastic bags will never break down and will remain with us and injure our wildlife forever. Is it realistic to think of banning them all over? We think it is worth a shot. Thanks so very much for stopping by and for the comment.